A laidback woman comes from the behind the building to greet me upon hearing the call of her name. She is stationed on the benches of the National Art Gallery’s back porch overlooking the Sculpture Garden – just above the newly opened Amphitheatre named “Fiona’s Theatre” – that opens to Hospital Lane. Sporting a cool summer dress in the middle of Bahamian fall, she says she was “soaking up the sun and catching up on messages” while waiting for my arrival. She is Sasha Dees, a Dutch independent curator, festival and theatre producer and arts writer, currently doing research across the Caribbean. “The research that I’m doing is actually not a part of anything. It’s really in my interest. So, what happens is there’s a mid-career grant – the governmental visual art fund – that’s there for artists but also people working within the arts like curators, writers and so on to take some time off to do something they always wanted to do but never found the time or had the money to do. Sasha Dees with Bahamian collector Dawn Davies at her home during one of her many visits. 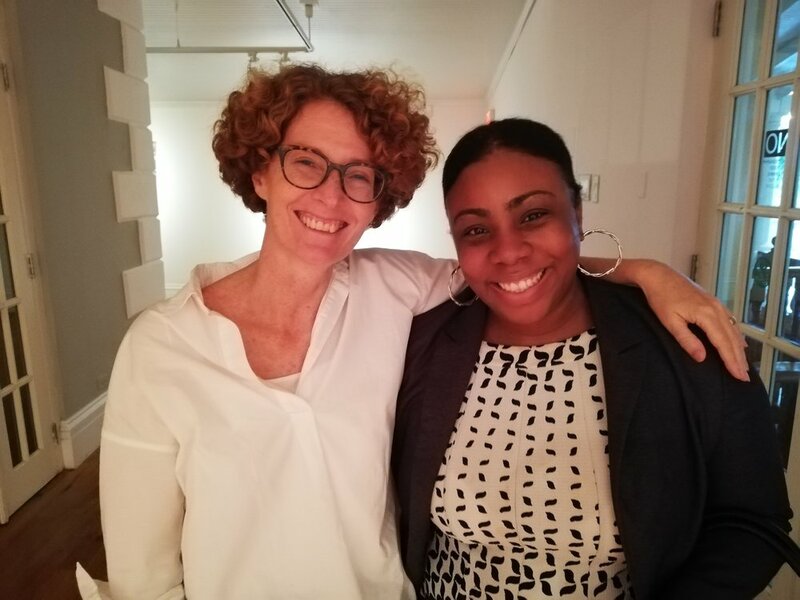 Dees was awarded a Mondriaan Fonds grant to do research across the Caribbean on the sustainability of art practices and the influence of international funding, projects and markets and its contribution (or lack thereof) to the sustainability of Caribbean artists. The grant does not require Dees to make a presentation of her findings after traveling for14 months, but she thought it’d be nonsensical to travel do research and not record anything at all. Thus, she contributes weekly to an online Dutch magazine called Trendbeheer and monthly to an English E-zine called Africanah, edited by Rob Perree. She is also fortunate enough to have landed a book deal to which she will continue to refine her findings. The grant, however, does give her a monthly stipend that she may maintain herself, and in moving across the Caribbean she has been prosperous in finding hosts to stay with, oftentimes museum directors, curators and/or staff of these formal and informal art spaces. So far, Dees has travelled to 13 countries within the region. In total, she is set to see another three- all together 16 to gather her research. When she left earlier this week she went on a second trip to Barbados and Trinidad, then on to the Francophone departments of Martinique and Guadeloupe. Amazingly, she’s found that there are more artists working off their art than meets the eye. Though they may not always make direct sales from their actual pieces or bodies of work, she finds most artists still make a comfortable living working within the field as curators, writers, directors, educators and so on. When comparing and contrasting America and the United Kingdom to the Caribbean, Sasha says Caribbean arts and artists “don’t do bad at all”, considering the difference in population and amount of people actually working within the arts. She finds the difficulty lies within the infrastructure of programming for the arts, specifically on much smaller islands. For instance, where large countries like the U.S. would have the accessibility to funding and other elements like programs in formal institutions like Bachelor degrees in Fine Arts, smaller Caribbean countries would find it difficult to establish because the population and interest is too small, and this in turn causes countries to lose artists. With this difficulty, presents others like museum spaces being limited to only showcasing the heritage and history of a nation’s culture through displays. This causes the art space to miss out on showcasing contemporary art either individually or juxtaposed to more historical pieces that makes space for even wider conversations to be had and newer perspectives to be formulated. In another light, Sasha finds that most Caribbean islands do facilitate a lot of art initiatives within their communities to keep inspiration alive and show support for the artists. She says these same communities and community leaders, however, must find ways to push the Orange Economy forward on their respective islands. “I spoke with John Cox from The Current at Baha Mar and I think he’s onto something. It’s trying to find ways where you combine the commercial to be cost effective, and also give space to contemporary artists who do conceptual work or work that is not sellable. It’s very important to have art that starts those necessary conversations, but how do you pay for them?”, she poses. Throughout the entire experience thus far, Sasha says the most valuable lesson she’s learned that can be useful to the sustainability of art practices within the region is in making connections and fostering it. “I think if you make connections within the region, it would afford you the opportunity to make connections internationally too. I also think it helps with the creative process of the artistry and opens artists up to have a critical discourse about their work in comparison to their counterparts.